The master bedroom reno is moving very very sloooooooooowly but I thought I'd share with you a sneak peek. The panelled wall is all done and I love love love it! This room is quickly turning into my favourite room in the house. The panels were done with mdf strips and we added some trim from Central Fairbank Lumber. I followed a tip from Tracery Interiors (love their work!) and painted everything - walls, trim, doors, ceiling - in the same paint colour, Benjamin Moore Seapearl OC-19 to really expand the space. The colour is perfect... warm white in the day, and a soft grey-oyster shade at night. It doesn't feel too cold or modern, and really brings out the details in the panels. We went all out and splurged for the Benjamin Moore zero-VOC Natura paint which had absolutely no odor and went on like a dream. Wish I could use that paint for all my projects! We also installed my dreamy vintage flower capiz chandelier. I bought it on ebay years ago for a steal and was waiting for the perfect spot to install it in this house. I think we found the spot!! If you like the light, I've seen modern reproductions of it here and here. So that's it for now. More peeks to come! Wow. Fabulous light, great panelling. The finished product will be worth the wait! It looks fantastic. I love that light and was thinking of a capiz shell one for our bedroom as well. I'm off to check out your links. That's more like a tease! It is wonderful. I cannot wait to see it all! looks amazing so far! - please post a detailed tutorial re: how to get that elegant paneled look; I'd love to reproduce it in my home. It's beautiful! I can't wait to see the rest! I LOVE it. I would love to put a chandelier in all of my bedrooms but I have to have a ceiling fan. Function wins over form on that one. I can't wait to see the whole room. looks great! Seapearl is the way to go! You are SUCH a tease! I love it! Can't wait to see the rest. That light fixture is wonderful. I'd love to hear more about how you did the trim! Cannot wait to see the finished room! I love the molding and that chandy! Oh wow - it looks gorgeous, and that is just such a small sneak peek! I can't wait for the big reveal! I looooove that chandelier! Love it! But these things take time. Can't wait to see the full reveal! Can not wait for the reveal. That looks incredible. 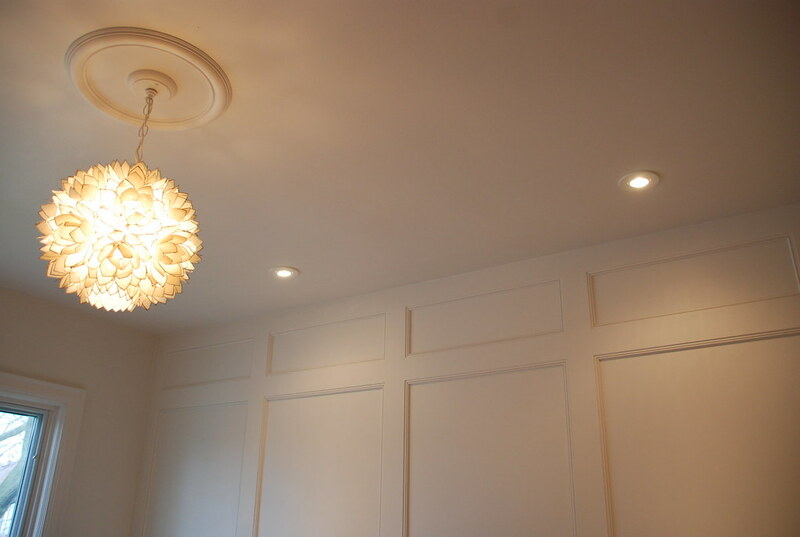 Beautiful panelled walls...can hardly wait to see the full after shots. I'm loving the walls. Will there be a DIY tourial?? I really love the fixture and the paint color and the panel walls! This looks amazing! I love the panel and the lighting is gorgeous - can't wait to see the final product. I LOVE the wall too ... can't wait to see the whole room. So beautiful! I'm impressed by all of that woodwork work and am in love with the capiz chandelier. I'm such a bad blogger - I didn't take too many in progress photos, but I will put together a post soon on how we did the trim. Looks great - can't wait to see the rest. It looks great so far!! I am so in love with that light fixture, and have ogled it for a long time, but I too have no where to put one at this moment in time, so I will just admire yours for now instead! The little decorative additions that make the house a lovely home.This chandelier is lovely. I am so glad I stumbled upon your blog!! I found your kitchen reno on Rate My Space about a year ago and fell in L*O*V*E!!! It is one of my all-time favorite kitchen renos. Excellent taste!